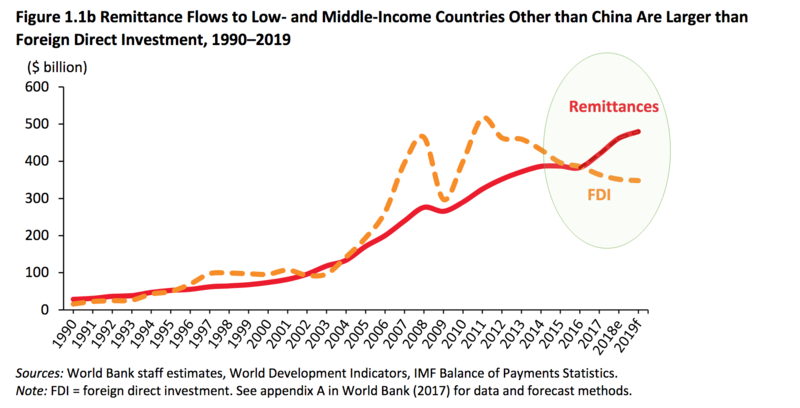 Remittances to low- and middle-income countries reached a record high in 2018, according to the World Bank’s latest Migration and Development Brief. Regionally, growth in remittance inflows ranged from almost 7 percent in East Asia and the Pacific to 12 percent in South Asia. The overall increase was driven by a stronger economy and employment situation in the United States and a rebound in outward flows from some Gulf Cooperation Council (GCC) countries and the Russian Federation. 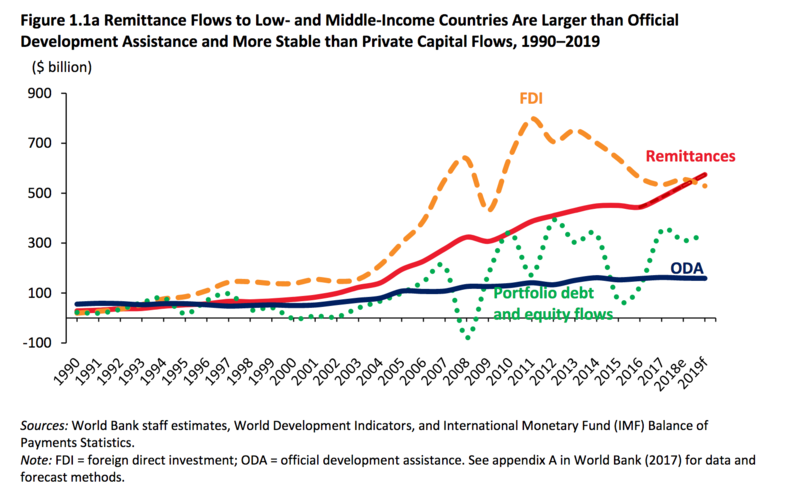 Excluding China, remittances to low- and middle-income countries ($462 billion) were significantly larger than foreign direct investment flows in 2018 ($344 billion). The global average cost of sending $200 remained high, at around 7 percent in the first quarter of 2019, according to the World Bank’s Remittance Prices Worldwide database. Reducing remittance costs to 3 percent by 2030 is a global target under Sustainable Development Goal (SDG) 10.7. Remittance costs across many African corridors and small islands in the Pacific remain above 10 percent. Banks were the most expensive remittance channels, charging an average fee of 11 percent in the first quarter of 2019. Post offices were the next most expensive, at over 7 percent. Remittance fees tend to include a premium where national post offices have an exclusive partnership with a money transfer operator. This premium was on average 1.5 percent worldwide and as high as 4 percent in some countries in the last quarter of 2018. “Millions of low-skilled migrant workers are vulnerable to recruitment malpractices, including exorbitant recruitment costs. We need to boost efforts to create jobs in developing countries and to monitor and reduce recruitment costs paid by these workers,” said Michal Rutkowski, Senior Director of the Social Protection and Jobs Global Practice at the World Bank. The World Bank and the International Labour Organization are collaborating to develop indicators for worker-paid recruitment costs, to support the SDG of promoting safe, orderly, and regular migration. Remittances to the East Asia and Pacific region grew almost 7 percent to $143 billion in 2018, faster than the 5 percent growth in 2017. Remittances to the Philippines rose to $34 billion, but growth in remittances was slower due to a drop in private transfers from the GCC countries. Flows to Indonesia increased by 25 percent in 2018, after a muted performance in 2017. After posting 22 percent growth in 2017, remittances to Europe and Central Asia grew an estimated 11 percent to $59 billion in 2018. Continued growth in economic activity increased outbound remittances from Poland, Russia, Spain, and the United States, major sources of remittances to the region. Smaller remittance-dependent countries in the region, such as the Kyrgyz Republic, Tajikistan, and Uzbekistan, benefited from the sustained rebound of economic activity in Russia. Ukraine, the region’s largest remittance recipient, received a new record of more than $14 billion in 2018, up about 19 percent over 2017. This surge in Ukraine also reflects a revised methodology for estimating incoming remittances, as well as growth in neighboring countries’ demand for migrant workers. 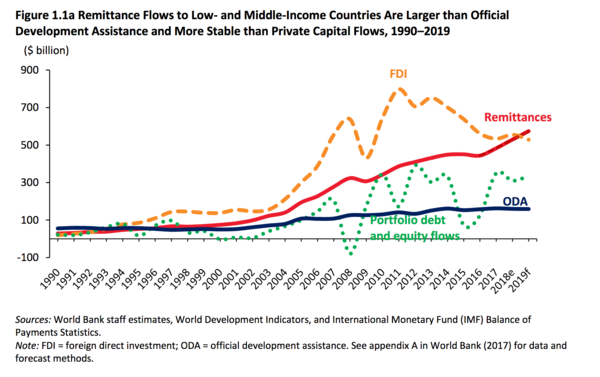 Remittances flows into Latin America and the Caribbean grew 10 percent to $88 billion in 2018, supported by the strong U.S. economy. Mexico continued to receive the most remittances in the region, posting about $36 billion in 2018, up 11 percent over the previous year. Colombia and Ecuador, which have migrants in Spain, posted 16 percent and 8 percent growth, respectively. Three other countries in the region posted double-digit growth: Guatemala (13 percent) as well as Dominican Republic and Honduras (both 10 percent), reflecting robust outbound remittances from the United States. Remittances to the Middle East and North Africa grew 9 percent to $62 billion in 2018. The growth was driven by Egypt’s rapid remittance growth of around 17 percent. Beyond 2018, the growth of remittances to the region is expected to continue, albeit at a slower pace of around 3 percent in 2019 due to moderating growth in the Euro Area. Remittances to South Asia grew 12 percent to $131 billion in 2018, outpacing the 6 percent growth in 2017. The upsurge was driven by stronger economic conditions in the United States and a pick-up in oil prices, which had a positive impact on outward remittances from some GCC countries. Remittances grew by more than 14 percent in India, where a flooding disaster in Kerala likely boosted the financial help that migrants sent to families. In Pakistan, remittance growth was moderate (7 percent), due to significant declines in inflows from Saudi Arabia, its largest remittance source. In Bangladesh, remittances showed a brisk uptick in 2018 (15 percent). Remittances to Sub-Saharan Africa grew almost 10 percent to $46 billion in 2018, supported by strong economic conditions in high-income economies. Looking at remittances as a share of GDP, Comoros has the largest share, followed by the Gambia , Lesotho, Cabo Verde, Liberia, Zimbabwe, Senegal, Togo, Ghana, and Nigeria. Bangladesh, Romania, Filippine: ecco il podio delle rimesse degli immigrati che vivono e lavorano in Italia. Il trend è in forte aumento: nel 2018 sono stati inviati all’estero 6,2 miliardi di euro, con una crescita annua del 20, 7 per cento. 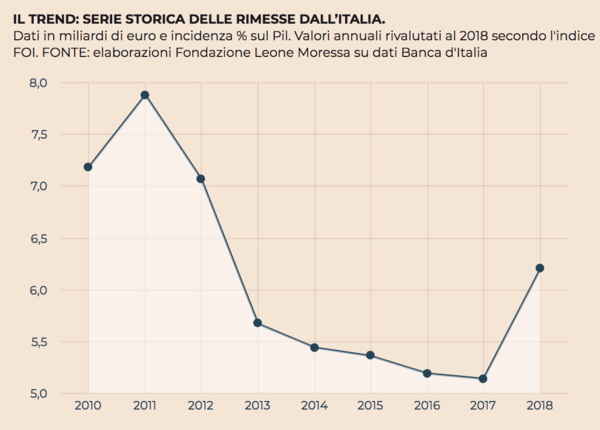 A registrarlo è uno studio della Fondazione Leone Moressa su dati Banca d’Italia, dopo il crollo del 2013 e alcuni anni di sostanziale stabilizzazione, oggi il volume di rimesse rappresenta lo 0,35% del Pil. Per la prima volta, nel 2018 il Bangladesh è il primo Paese di destinazione delle rimesse, con oltre 730 milioni di euro complessivi (11,8% delle rimesse totali). Il Bangladesh nell’ultimo anno ha registrato un +35,7%, mentre negli ultimi sei anni ha più che triplicato il volume. Il secondo Paese di destinazione è la Romania, con un andamento stabile: +0,3% nell’ultimo anno e -14,3% negli ultimi sei. Da notare come tra i primi sei Paesi ben quattro siano asiatici: oltre al Bangladesh, anche Filippine, Pakistan e India. Proprio i Paesi dell’Asia meridionale sono quelli che negli ultimi anni hanno registrato il maggiore incremento di rimesse inviate. Il Pakistan ha registrato un aumento del +73,9% nell’ultimo anno. Anche India e Sri Lanka sono in forte espansione. Praticamente scomparsa la Cina, che fino a pochi anni fa rappresentava il primo Paese di destinazione e oggi non è nemmeno tra i primi 15 Paesi per destinazione delle rimesse. Mediamente, ciascun immigrato in Italia ha inviato in patria poco più di 1.200 euro nel corso del 2018 (circa 100 euro al mese). Valore che scende sotto la media per le due nazionalità più numerose: Romania (50,29 euro mensili) e Marocco (66,14 euro). 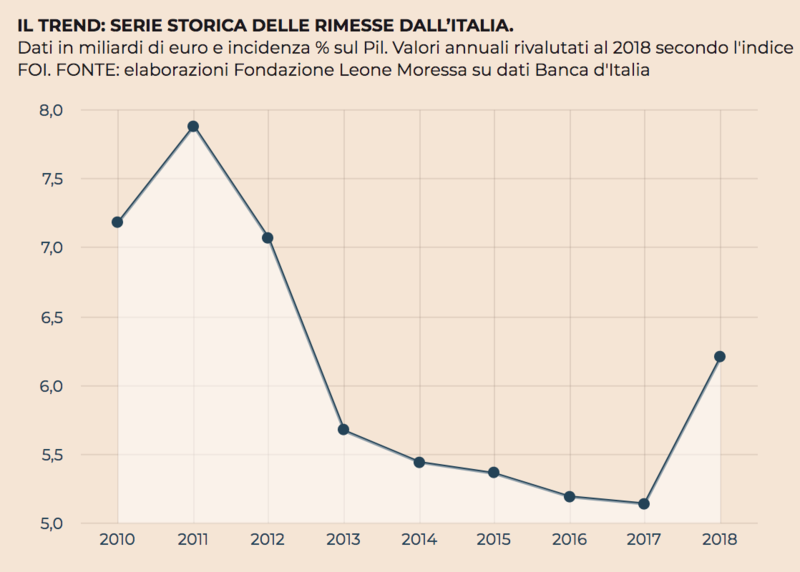 Tra le comunità più numerose il valore più alto è quello del Bangladesh: ciascun cittadino ha inviato oltre 460 euro al mese. Anche i senegalesi hanno inviato mediamente oltre 300 euro mensili.